Warren and White trained with Donna Eden, a prominent energy medicine healer for more than 30 years, who has trained some 80,000 people worldwide, both laypeople and professionals, including more than 300 certified practitioners, how to engage their own energies for greater health. 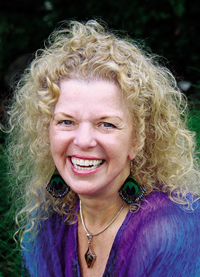 She is the author of two books, “Energy Medicine” (revised 2008, Tarcher), named self-help book of the year in 2008 by U.S. Book News, and “Energy Medicine for Women.” On Friday and Saturday, March 5 and 6, Eden is coming to New Jersey for the first time to hold a two-part workshop at the Doubletree Hotel in Mt. Laurel, just 40 minutes from Princeton. Warren and White have been invited by Eden to serve as teaching assistants during the workshops. One of the patients Yi referred to Diana Warren was Barbara Clarke, first VP, wealth management, of Morgan Stanley Smith Barney on Lenox Drive. Clarke, who also is a certified divorce financial analyst, was featured in U.S. 1’s October 14, 2009, cover story, “A Kinder, Gentler Kind of Divorce.” Like Yi, Clarke was initially skeptical about energy medicine — but that didn’t last long. “I realized right away that I didn’t understand what Diana was all about, but that if she was as talented as Dr. Yi claimed, then I needed to suspend disbelief, surrender myself to her ministrations, and follow her protocol — without resistance. I’ve been seeing her every other week (for eight months), and I can assure you that this energy work has become a powerful ally in my life. According to Eden’s book “Energy Medicine,” in order for the body to stay healthy, energy — which is understood as the “life force” that feeds each organ and body system — has to move and have space to continue to move. Energies may become blocked or imbalanced due to toxins, stress, or interference from other energies. Energy medicine draws upon healing practices such as acupuncture, qi gong, yoga, and kinesiology to restore or rebalance the body’s energies through non-invasive techniques such as tapping, massaging, pinching, twisting, or connecting specific energy points on the skin; tracing or swirling the hand over the skin along specific energy pathways; and exercises, postures, and focused use of the mind to move specific energies. Individuals can do it on their own or with a trained practitioner. “People experience a change, something shifts that is very palpable to them,” says Geoffrey White, a Princeton native who has been practicing energy medicine since 2002, training first with Joseph Pinter, a holistic practitioner and naturopath whose practice, Biomega, is located at 60 Mt. Lucas Road, and then with Donna Eden. White sees energy medicine clients two to three days a week. His partner, Diana Warren, is also a CMT (certified massage therapist). A particularly remarkable story is one White tells about a female client who has had MS for 20 years. “Her daughter brought her in, and she had her initial session with us. Then they went across the street to Main Street (bakery). She needed to use the restroom, which is on the second floor. At the top of the stairs, about to come back down, she stopped. She realized she had walked up the stairs like a normal person, where she had been going up the stairs one at a time for so long. She didn’t realize it until she started to come down. Now she’s been out golfing and all kinds of other things. Experience the Power of Energy Medicine, introductory seminar, Friday, March 5, 7 to 10 p.m., and interactive all-day workshop Saturday, March 6, 10 a.m. to 5 p.m., Doubletree Hotel, 515 Fellowship Road North, Mt. Laurel. World-renowned energy medicine healer Donna Eden and energy psychologist David Feinstein, Ph.D. Friday introductory seminar only, $45; Saturday all-day workshop, $129 (includes Friday evening; you must attend Friday evening to attend Saturday). Diana Warren and Geoffrey White of Energy for Healing, Kingston Wellness Center, 4426 Route 27, Kingston www.energyforhealing.com, 609-468-1286 or 609-937-7682) will serve as teaching assistants. For information on Donna Eden visit www.innersource.net. Register. 856-470-1399 or www.readytotransform.com.